Easy with some moderate elevation. 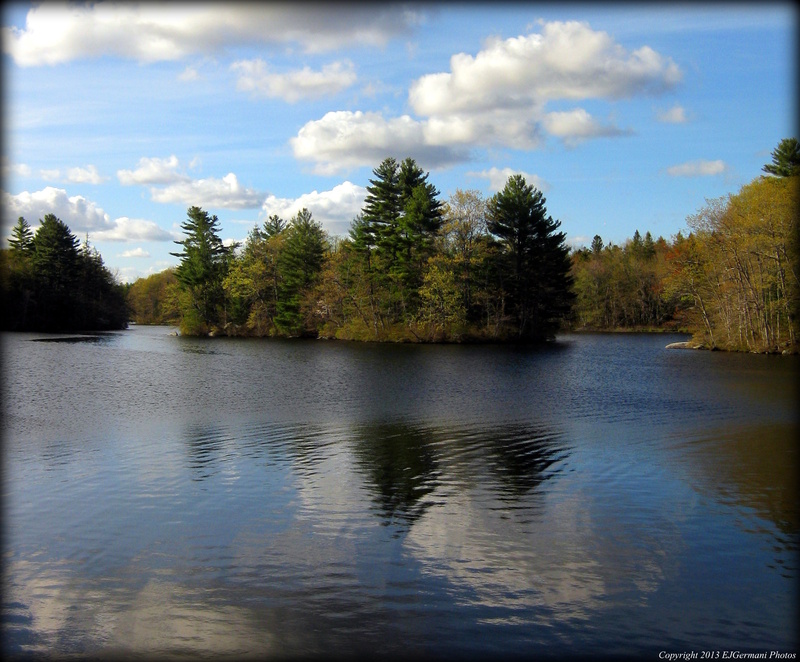 Barden Reservoir is part of the Scituate Reservoir system which is the public drinking water for the metropolitan Providence area, therefore, it is off limit to hiking among several other things. The country roads that surround the reservoir however make for a beautiful and peaceful walk. Starting in Foster from a small pullover across from a historical cemetery just west of the Barden Reservoir Bridge on Central Pike I started walking west and then turned onto Kate Randall Road. This was a long dirt road with a fairly steady incline that was surrounded by woods and stone walls. This is where you first notice the several “No Trespassing” signs along this walk. At the next intersection I then turned left onto Hemlock Road. There were two signs of slight concerned. One being “Dead End” and the other being “Road Work Ahead”. At the current time the road is completely passable for pedestrians. About halfway down this road there is a gate that prohibits vehicle traffic to go any further. I continued past the gate going downhill until I came to a wooden bridge. Here were the first sweeping views of the reservoir. After crossing the bridge and a little further down the road you cross into Scituate. At the next clearing to the left there is a dam. The man made waterfall cascades down to some rather large boulders below making for a beautiful scene. Here I found a biker taking some time to soak up some sun. After checking out the falls, I then turned north onto Ponagansett Road. Along this stretch that runs along the reservoir for a while are some more historic cemeteries. As the road starts turning inland and away from the reservoir you cross back into Foster. The road starts going uphill for a bit. Along this stretch I was greeted by a few friendly border collies that apparently reside at a farm on the right. There was a pasture to the left with sheep. A little further up the road on the left there was a field with horses. At the next intersection I turned left and downhill onto Central Pike back to the car. I advise walking facing traffic along this stretch as this is a main road.